On the last post, I mentioned I was late getting on the fashion love train. I read several fashion blogs that have inspired me to step out a bit and try some new things. It also helps ( a lot!!) to have a 16 yr. old fashionista as a daughter. One trend this fall is military jackets. I found these Pinterest photos recently that I liked. Here's a couple of photos I took of myself yesterday. I found this jacket at Kohls in the Junior Department. It was about $30. The scarf is from TJ Maxx. Fashion can be a lot of fun. You can read more about how I came to enjoy playing around a little with fashion here. I do feel a little goofy taking my photo, but it does help me to see how something actually looks. Have a great first week of October! I'm just starting to get my fall things out of storage and hope to post some photos next week. Love the military jacket! Just got a military vest that I can't wait to rock! I like it, too! I never would have thought I would like something like it. I just checked out your blog. I really liked it. Glad I found you today! The jacket looks great! I can't believe you are a mom to six - you look amazing! I've been looking for a great military jacket! I love it with the leopard scarf. I get a lot of my fashion inspiration from Pinterest! Visiting your blog via the linkup. Hi Alyssa! Thanks so much for writing. 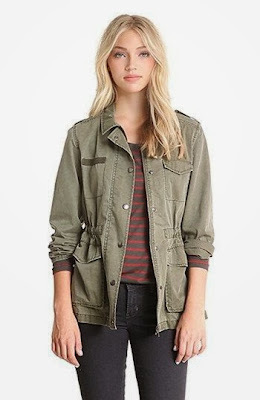 There's also a really cute jacket on the Nordstrom's site that one of the blogs I read recommends. P.S. I like your blog a lot, too! Love the military jacket on you. Cool look. The scarf is amazing and looks totally cool with the jean jacket. Thx for dropping by my blog. Yes, I read her blog also! You are very kind, but I just post photos that turn out the best. lol I rarely shop at malls, but find the best deals at T.J. Maxx and places like that, as well as reading her blog. It has helped me out so much. I've never cared for clothes shopping at all. Love the jackets! Thanks for linking up with What I'm Loving Fridays! Come back this week for some exciting stuff!